To download, right click on the above link and select “Save Link”, “Save Target”, or “Save As” (depends on the browser). The Heat Controller software requires Windows 7 or 8 operating system (32 or 64 bit). Download the software onto the computer and connect the Heat Controller to the computer vis a USB cable. The downloaded Heat Controller software automatically checks that you are running the latest versions of both the software and firmware when the software is started. The firmware update procedure is detailed in the Heat Controller Software Manual, which is automatically installed with the downloaded Heat Controller software. Error “0” means no cables are connected to the unit or the heating circuit in the Warm Inspired Air Control Unit and the sensor circuit in the Heated SW Circuit are both faulty. The following tests identify the most common sources of the error messages, since they test the Auxiliary Temperature Probe and the Heated SW Circuit separately. In the unlikely event that a fault would appear suddenly in both, further testing is required. Contact DarvallVet Technical Support at 866-931-3292 X102. Error “0” – Turn the unit off and disconnect the Auxiliary Temperature Probe and the Heated SW Circuit connecting cable (part #8615). Turn the unit on. The unit should display the Error Message “0” (Err0). This is normal. It indicates that no cables are connected to the unit. Contact DarvallVet Technical Support at 866-931-3292 X102. The 15-pin connector is not attached securely. If the 15-pin connector is not fitted correctly it can cause an Error “0” (Err0) or Error “4” (Err4) message. The Heated SW Circuit is faulty. Connect a different Heated SW Circuit to the cable. If the unit no longer displays the error message, the problem has been identified as a faulty Heated SW Circuit. Discard the damaged Heated SW breathing circuit. If the error message persists: If the error message persists, contact DarvallVet Technical Support at 866-931-3292 X102. Darvall Heated SW Breathing Circuit tubing is NOT designed for surface warming of skin. Avoid prolonged direct contact with the animal’s skin. DO NOT position heated tubing under anesthetized animal’s body or limbs at any time. Always protect the animal’s skin from the heated tubing with a barrier such as a dry cloth towel positioned between the animal and the tubing. Always keep the heated tubing uncovered and above or to the side of the animal. DO NOT position heated tubing underneath an animal’s body or limbs. DO NOT cover or wrap the heated tubing. Covering the heated tubing with the animal’s body or limbs, covering it with a sandbag or wrapping a section of heated tubing with a towel can concentrate heat in one area of the tubing. This concentration of heat can raise the tubing wall temperature high enough to burn skin. The 4-pin male connector on the Smooth Wall Heated Tubing Connection Cable (part#8615) connects to the female connector on the Heated SW Circuit (part#8347 or #8348). This connection MUST be aligned correctly to avoid damage to the Darvall Warm Inspired Air Control Unit. If connected improperly, the computerized control board in the Darvall Warm Inspired Air Control Unit may be damaged and its warranty will be void. For complete instructions on connecting them properly, click here. Darvall Smooth Wall (SW) Breathing Circuits come in two sizes: LARGE and SMALL. Large is for animals weighing over 45# and the collar color is blue. SMALL is for animals weighing under 45# and the collar color is tan. 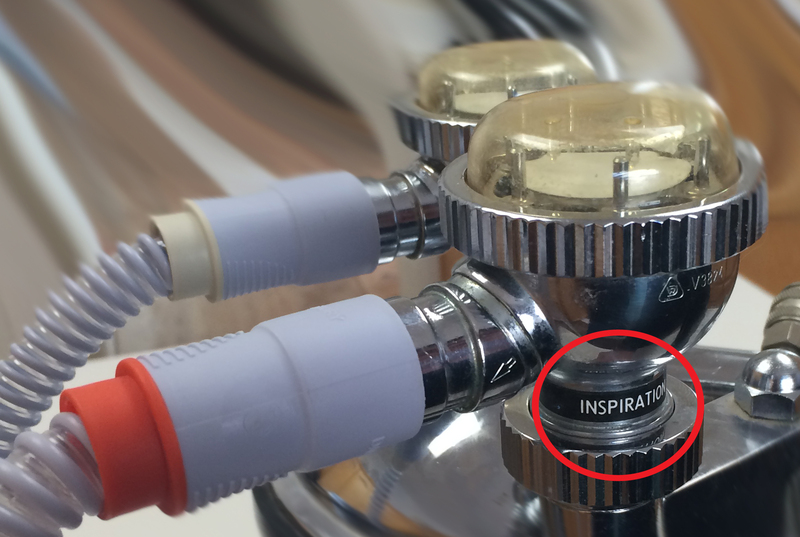 In order to deliver warm inspired air to an anesthetized animal, the tubing with the orange collar must be connected to the inspiration side of the circle system. Darvall Smooth Wall (SW) Breathing Circuits are designed to warm inspired gases at lower oxygen flow rates. At higher oxygen flow rates the gases move too quickly through the tubing to allow sufficient warming. 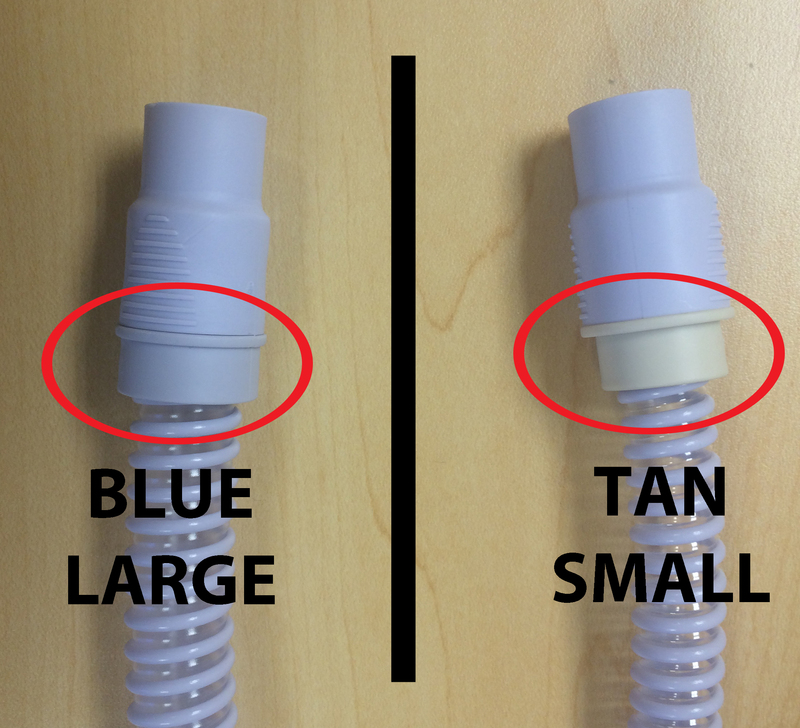 The suggested oxygen flow rate for Darvall Smooth Wall (SW) Breathing Circuits is 30ml/kg/minute. For more information about oxygen flow rates and circle systems, read Go With The Flow – How to decide the oxygen flow rate for small animal anesthesia.